I’ve always enjoyed a good adventure tale—swords, boots, sailing ships. These days, many of those are found in the Fantasy genre and often include some magic or monsters as well. Scott Lynch’s Lies of Locke Lamora fits the bill with the added bonus of a caper. This book is the first in an on-going series, currently three volumes long and looking toward a fourth in 2016. 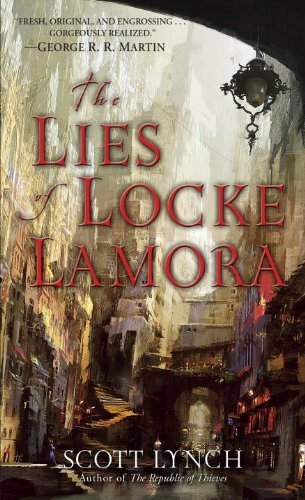 Our protagonist, Locke Lamora, has been raised by a Fagin-esque mentor as a well-educated thief and swindler in a late medieval alternate universe of city states. Much of the action involves Locke and his pals (gang?) cleverly swindling an aristocrat while becoming entangled in lethal underworld wars. Think “Ocean’s Eleven” in tights mixed with a little “Gangs of New York” and a helping of “Game of Thrones.” The twisty fast-moving plot and the charm of the characters carry the book along. Some of the violence is extreme, and the language is salty—although inventive. I listened to the audio version, narrated by Michael Page. The other books in the series are Red Seas Under Red Skies and The Republic of Thieves.